SCOTTSDALE, AZ-Audio and video are not the center of attention at an Islands Restaurant, the Hawaiian-themed family chain of establishments that just built its 50th location here. It's safe to say, however, that the dining experience at one of the chain's eateries wouldn't be the same without its understatedly studied approach to AV. For the audio at Islands, Rane CP64 and CP52 processors, QSC CX 204V amplifiers, and a combination of approximately 30 JBL Control 24 CT flush-mounted and Control 25 surface-mount speakers play out customized music programming from the web-based Trusonic system and backup Sony CD player. At Islands, system designer/integrator Todd Berman of TAB Technical Services has been guiding the use of AV since the chain's founding in 1982, ensuring that high-quality audio and video are used as a subtle accessory to keep the spotlight on the restaurants' gourmet Big Wave burgers and Island fries. "People have been developing restaurant theme designs for a while now, whether it's rainforests or hard rock," Berman pointed out. "With every new concept, AV is going to have to be a part of it-I can't see a new chain opening without it. At Islands, the challenge, especially from a visual point of view, is to make sure that the technology fits in with the architecture, décor and all the other aspects of the venue. 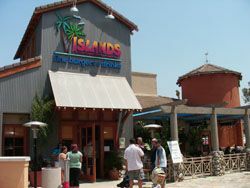 "For the new Scottsdale location, Berman and his team planned a carefully sculpted video environment that adds to the escapist intentions of the Islands atmosphere, showing proprietarily produced footage of sports like surfing, skiing, and skateboarding on three Panasonic TH-42PWD8GK 42-inch plasma screens, and eight additional 27-inch Zenith CRT TVs in the dining room and bar. The content plays out from a Sony 6-disc DVD player, and along with broadcasts from dual Dish network satellite receivers, goes through a Channel Vision 3-channel modulator to the plasmas. A remote control link to the equipment rack gives the restaurant manager the flexibility to route different sources to different screens at his or her discretion. For the new Scottsdale location of the Islands Restaurant chain, TAB Technical Services planned a carefully sculpted video environment that adds to the escapist intentions of the Islands atmosphere. Berman prefered to go to the extra effort and expense of providing a one-to-one coaxial connection from each plasma screen to the head end. "Each TV has its own line to the back of the rack," he confirmed. "That yields better picture quality. You can save money by looping the co-ax, but if you have one problem, all of them will have a problem. When you home-run each one, a glitch with one TV won't affect the others. It takes a little more time and money, but in the long run you're saving money." For the audio portion, Rane CP64 and CP52 processors, QSC CX 204V amplifiers, and a combination of approximately 30 JBL Control 24 CT flush-mounted and Control 25 surface-mount speakers play out customized music programming from the web-based Trusonic system and backup Sony CD player. A total of eight different zones are established and attenuated with Atlas 70V volume controls to provide different listening levels for each zone, if needed. Throughout the establishment, Berman's sound system is designed to wage a gentle battle with the sometimes overwhelming ambient noise that comes from the large gatherings of people and children that come with the territory of a family restaurant. "We overcome that by applying a large number of speakers, as opposed to bigger speakers and fewer of them," he said. "For a smaller, box-type speaker, the JBL 25 fits things perfectly-I like the sound quality for the size. We create our own special hanging mounts for them so we can put up two speakers back-to-back. The JBL 25s are very directional, so they're also hooked up to the television in the bar for what we call 'spot audio' that is focused on the bartops, which allows people there to listen to a sporting event, for example, without disturbing the other patrons. The JBL 24s are used in the bathrooms and the entryway."